What is Income Tax Return? Income Tax Return is a form through which you report the details of your income from various sources and tax paid there onto the Income Tax Department. The Income Tax Act 1961, obligates certain eligible persons to file their income tax return. Filing of Income Tax Return legitimize your earnings. Not filing it means that you have not disclosed your income which becomes your Black Money. Also, by filing your Income Tax Return you can get income tax refund, if you have paid excessive tax to the government. Who is required to file Income Tax Return? Is there any benefit of filing return if my income does not exceed Rs 2,50,000? What will happen when I have taxable Income, but do not file my income tax return? What happens if I don’t file Income Tax Return on or before due date? If your income exceeds the basic exemption limit, before deductions in the financial year then you’re required to file Income Tax Return. The same rule applies on NRI as well (ITR form for NRI is ITR-2). You are required to file return irrespective of the fact whether you have paid tax or not. So, even if you are under impression that there is no need for you to file income tax return since employer has deducted TDS in full, then you are mistaken. This basic exemption limit varies depending upon the age of the person filing income Tax return. You want to claim refund. You wish to carry forward the loss under any head of income to the next year. You have an asset or financial interest in an entity located outside India.This point is applicable only on resident individuals and not on NRI or NRO’s. You are a signing authority in a foreign account.This point is also applicable only on resident individuals and not on NRI or NRO’s. You are a firm or a company. You are trust (charitable/ religious/political/research association etc.) and derive income from the activities / property held by trusts. However in certain cases the government has made e-filing of return mandatory. You wish to claim refund due. Your accounts are required to be audited u/s 44AB of the Income Tax Act. You have paid taxes outside India and wish to claim relief for avoiding double taxation u/s 90 , 90A or 91 of Income Tax act. You are an ordinary resident and have a signing authority in a foreign account. You are an ordinary resident and has assets or financial interest in an entity placed outside India. Accidental Claims : This is one of the benefits that comes to picture when you meet with an accident and want accidental claim from the insurance companies.If you have your income tax returns with you then court applies simple formula to arrive at the claim amount. The formula for claim is by multiplying the yearly income in ITR with years of expected life of deceased. Proof of Income:/Proof of Net worth : What’s the best document for your Income Proof? No brownies for guessing this one. Yes, we all know it’s your income tax return. Refund: You can claim refund, of the amount that you paid excessively to the department. There is no bigger joy than getting back your money from the Income Tax Department. Eligibility in Loan Application: Income Tax Returns of last three years is one of the basic documents required for loans. This helps banks in judging your pay back capacity. ObtainingVisa: For travelling abroad, foreign consulates of many countries ask you to furnish last 3 years’ income tax returns or current year’s income tax return. Absence of any return can reduce the chances of you getting visa specially under the visitor, investor and work permit category. Carry forward of losses: Want to claim last year’s business loss? File your income tax return and you’re all set for it. For Startup Funding: Looking to raise funds from VC’s, angel? You need to have income tax returns filed till date ready. Many investors study your business scalability, profitability and other cost parameters from your business income tax return. Protection against Black Money: If you diligently file your income tax return every year, then your savings will never be at risk of being termed as black money by the Income Tax officials as any income not reported to Income Tax Department comes under the radar of black money. Buying insurance Policy with high life cover: Some insurance companies are adamant for income tax return while providing high life cover to verify your annual income. Obtaining Government Tender: Sometimes, furnishing your income tax return is a must to apply for government tenders specially when tender of high value are being awarded. Avoid penalty: Non-filing of income tax return can lead you in trouble with the income tax department. You carry the risk of not only paying penalty but interest on it as well. Credit Card Application: Want to flaunt a high limit Credit Card? Well, you better have your income tax return with you to get the hang of it. Growth of the nation: Be a part of the nation building process by filing income tax return. Late filing Fee u/s 234F shall be levied if return is not filed on or before the due date. The quantum of fees shall vary according to the amount of your income and return filing date. (c) Imprisonment with or without fine u/s 276D. Notice u/s 148 for furnishing return within the period as mentioned in the notice. A penalty of minimum 100% to maximum 300% of the amount of tax for concealment of income u/s 271(1)(c). Interest u/s 234A keeps on mounting at the rate of 1% per month/ part of the month till the time you file your return. Also, you'd be required to pay interest u/s 234B and 234C, both at the rate of 1% per month/ part of the month if you've not complied with the advance tax provisions at the time of late filing of return. When should I file my Income Tax Return? Due date of filing Income Tax Return is 31st August after the end of each financial year for which it is to be filed. This date may be extended by Income Tax Department. So, for the financial year 2017-18, the due date would be 31st August, 2018 unless its extended. Although, for the persons who fall in the ambit of tax audit, the due date is 30th September and in the cases where transfer pricing is applicable, the due date is 30th November after the end of the financial year. Person carrying on business and sales/turnover exceeds Rs.2 Cr. Person carrying on profession and Gross Receipts exceeds Rs 50 Lakhs. Person carrying on business or profession under provisions of section 44AD, 44AE, 44AF, 44BB or 44BBB and declaring income lower than the deemed income under the applicable section. Well, if you miss the due date ,you can redeem yourself by filing late/Belated Return which can be filed before the expiry of one year from the end of the relevant assessment year or before the completion of assessment whichever is earlier. Suppose, you forgot to file the income tax return for the Assessment Year 2016-17(F.Y. 2015-16) then you could still file the income tax return by way of filing belated return of this Assessment Year by 31st March 2018. But, due to the new amendment in the 2016 Budget, from Assessment Year 2017-18(FY.2016-17), you will be able to file the belated income tax return only till the expiry of the relevant Assessment Year. It means that for the returns filed for Assessment Year 2017-18, belated returns can only be filed till 31st March 2018. Further for the returns filed for Assessment Year 2018-19, Belated return/ Revised return can only be filed till 31st March 2019. Can’t revise your return, however, w.e.f. April 01, 2017 - even those who file a belated return from F.Y.2016-17, can revise that return later. Can’t carry forward the losses. Pay Interest under section 234A @ 1%/ month for late filing of return. Late filing fee u/s 234F amounting max upto Rs. 10,000 will be levied. Bank Account Details : Details like Bank Name,Account no & IFSC Code of all the accounts owned by you needs to be kept ready.You need to report a bank account even if you closed it during the year. Other Documents : These will depend on your income & deductions. Funds Sold- Statement of MF, Equity Funds, Debt Funds, SIP’s, ELSS. Log-on to https://incometaxindiaefiling.gov.in/ and register on the website. You will need to provide your PAN No., Date of Birth, Email ID, Phone No & Password. Your PAN no will be your User ID. If you are already registered then log-in using your User ID & Password. The Income Tax Act categorizes your income in five heads. Each income is treated differently. The type of income determines the Income Tax Return you have to file. Salary Income: It includes both salary income and pension income. The basic condition for an income to be called a salary income is that there needs to be employer-employee relationship between the payer and payee. Income from House Property: Rental Income that you receive from lending your house on rent is Income from House Property. Even income from the house that you’re residing in is also calculated but it will be either nil or negative. The income under this head can be negative owing to the deduction of interest available for interest on housing loan. Profits and Gains of Business or Profession: Income from carrying out business or profession is taxable under this head. The income chargeable to tax is the difference between the income received and expenses incurred. Capital Gains: Any profit or gain arising from transfer of capital asset held as investments (such as house, Jewellery, shares) is chargeable to tax under the head capital gains. The gain can be short term as well as long term. Income from Other Sources: Any income which cannot be covered under above heads is taxable under this head. Like interest on fixed deposits, lottery income etc. Deductions: Under Income Tax, you can get tax deduction for certain investments and expenditures. Yes, government is not only after taxes. It gives relief to taxpayers from the burden of taxes through these deductions. These investments and expenditures are listed in chapter VI A. Under this, there are many sections of Income Tax Deductions like section 80C, 80D, 80E etc. Once you have understood what your income was in the previous year, its time for you to file your income tax return. For this you need to find out the right income tax form applicable on you. There are 9 type of Income Tax Return(ITR) Forms based upon the nature of your income. For a salaried individual the relevant forms are ITR1,ITR2A & ITR2. However, the Aggregate Income can be Upto Rs 50 lacs only. Can use even Aggregate Income exceeds Rs 50 lacs. HUF Income from Business or Profession including profits from partnership business. ITR-5 LLP, AOP, BOI, Artificial Person u/s 2(31)(vii), Co-operative Society, Local Authority Not applicable to person who file return u/s 139(4A), (4B), (4C), (4D), (4E) & (4F). ITR-V All Acknowledgement of filing the return of income. 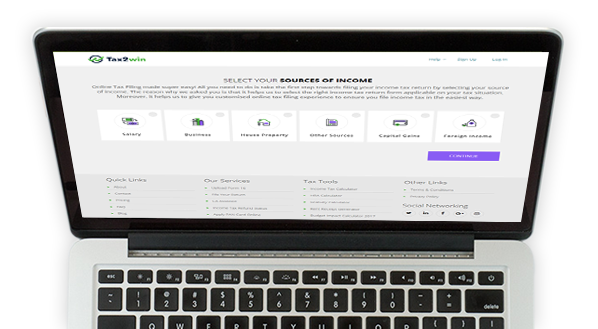 File from Tax2win https://tax2win.in/efile-income-tax-return/sources-of-income it automatically selects your form. The income tax website gives you various options to e-file your income tax return. If ITR 1/4S is applicable on you, then you can click on ”Quick e-file” option and fill details to file your income tax return. Alternatively, you can go to “Downloads” section and select the relevant ITR Form and save it on your system. You can now fill your ITR offline and upload it later. Fill Excel Utility based upon the Documents we discussed earlier. View 26AS, to check whether all your incomes & tax mentioned in Form 16 & Form 16A tally. Check the tax payable amount by clicking the option “Calculate Tax” in the excel utility. If tax is payable, then go to NSDL website (https://onlineservices.tin.egov-nsdl.com/etaxnew/tdsnontds.jsp) and pay tax using challan 280.After, paying tax enter tax payment details. Now, click on “Validate” Button to confirm all data is filled correctly. Click on “Generate an XML “ option & save it. Now go back to income tax portal, login and click on “Upload Return”. Then upload the saved XML file. A pop-up will ask you as to whether you wish to digitally sign the file. If you have digital signature then click on “yes” otherwise “no”. After you have successfully filed your return , ITR V will be generated by the tax department system. This is a summary document, which acknowledges that return has been received by the IT Department. This ITR V will be sent on your email ID. You are require to verify it.If you don’t verify your return it would be treated as if you’ve not filed your return. You should get an email acknowledging receipt of this ITR-V from the IT department once this ITR-V is received by them. You can refer https://blog.tax2win.in/simple-guide-e-verify-return/ for the step by step guide that will help you in verifying your income tax return. Avoid Hassles! What Happens After you File Income Tax Return? After you’ve verified your return, income tax department starts processing your return through its software which takes into account arithmetical errors and incorrect claims that are apparent from the information in the return. If there’s any discrepancy between your tax computation and that of software’s, then Intimation u/s 143(1) is issued to you. Discrepancies can be in the form of difference in tax/interest payable or refundable or increase/decrease in the loss claimed during the year. If there is no more additional tax payable or refundable or there is no adjustment resulting in a change in loss claimed during the year, then Intimation u/s 143(1) will not be sent to you and Income Tax Return Acknowledgement will be deemed as Intimation u/s 143(1). No intimation shall be sent after the expiry of 1 year from the end of F.Y in which return is made. However, it's practically observed that Intimation u/s 143(1) is issued even if there’s no discrepancy. Apart from the above intimation, you can be issued different notices under Income Tax Act like notice for defect in your return, income escaping notice etc. In some cases, your income tax return can even be selected for Income Tax Scrutiny which is the thorough examination of your income tax return wherein you might be asked to submit proofs of the income, expenses, investments and losses as declared by you in your return. Personal Information: This section of Income Tax Return contains identification information like Name, Gender, DOB, Address, PAN No, Mobile No, Email ID. Filing Status: This section contains information related to Residential Status, IT Section under which return is filed. There are various sections under which return is filed. 139(1): When return is filed voluntarily on or before due date. 139(4): Belated Return i.e. when return is voluntarily filed after the due date. 139(5):Revised Return i.e. when an amendment is made in the original return. :When return is filed in response to notice received from Income Tax Department under the said section. 139(9): Defective Return, i.e. when return is filed in response to a notice to remove defects in the original return is filed. Total Income: The details of income from all the five heads are shown in the income tax return. If your Net Total Income, i.e. Income after deductions is upto Rs 3.5 Lakh, then you're eligible for Rebate u/s 87A for Rs 2,500 or the amount of tax, whichever is lower. Bank Account Details: In this section, you need to enter all the details of all the bank accounts held by you during the year. For the purpose of Income tax, the residential status of the taxpayer plays a crucial role. For a resident, all incomes are taxable whether earned or accrued outside India but for a NRI, only income which accrues or arises in India would be taxable. Can NRI file ITR 1? No, from FY 2017-18, the income tax return form for NRI is ITR-2.